Baalbek is a city and temple complex holding one of the finest examples of Imperial Roman architecture. 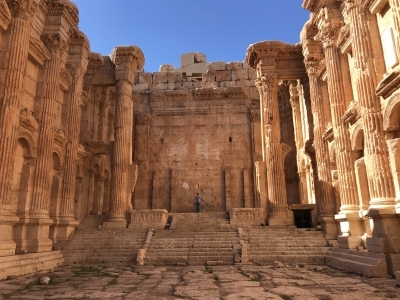 It is famous for its exquisitely detailed but monumentally scaled temple ruins of the Roman period, when Baalbek was one of the largest sanctuaries in the Empire. After the arrival of the Romans in Phoenicia in 64 BC, Phoenician beliefs and the Greco-Roman pantheon were mixed. Pilgrims worshipped here at the sanctuary of Jupiter, Venus and Bacchus, a succession to the triad of Phoenician fertility gods. The site was given the name Heliopolis. The construction of more and more temples went on into the 3rd century, its colossal size a testimony of Imperial Roman power. Baalbek nowadays is a midsize town in the Beqaa Valley. The designated area also includes non-Roman heritage, such as the Mameluk mosque of Ras-al-Ain. I went on an organized day tour from Beirut to Baalbek - one that efficiently also encompasses the WHS of Anjar (and some wine tasting at Ksara, but I am not fond of that). We were a group of six, of which I was the only one having come to Lebanon as a tourist. The others were here for work or study. Baalbek lies quite deep into the Bekaa Valley, which means that we first had to cross Mount Lebanon. It had been snowing until last week, and snow was still visible beside the road at the mountain pass. The road is not in a great shape, and is as busy with traffic as everywhere I have seen so far in Lebanon. The Bekaa is a fertile valley and the main agricultural zone of Lebanon. There were lots of fruit and vegetable stalls next to the road, as well as hanging slaughtered animals. Remarkable I also found the numerous tents of Syrian bedouins, who apparently come here to work as agricultural labourers. The current city of Baalbek mostly has a Shi'ite population, and they quite recently built a glittering new mosque not far from the archeological site. In town there also is a large Palestinian refugee camp. We started the tour with a quick visit to a quarry for the Baalbek site, at which it becomes clear how big the monoliths were that were used for construction. The Baalbek complex begins with the Temple of Venus, just outside the core zone and mostly in rubble. Then you enter the main site via an impressive stairway, the ceremonial entrance. Behind that the site opens up in all its splendour. The most impressive thing about Baalbek I found the density of the remains, and their height. The Temple of Bacchus looks almost complete (at least on the outside). There are finely sculptured details like the lionheaded gargoyles and the motifs on the side of the pools used for ritual washing. The circuit ends at an underground passage. This holds the badly lit and moist Baalbek museum. I had a quick look but could not "warm up to it". The best parts are in the National Museum in Beirut anyway. Save it for the last if you can, because not only is Baalbek the most stunning WHS of Lebanon, but even after couple of hundred sites visited, many many Roman ruins included, it still blew our minds and exceeded all our expectations. Just wow. 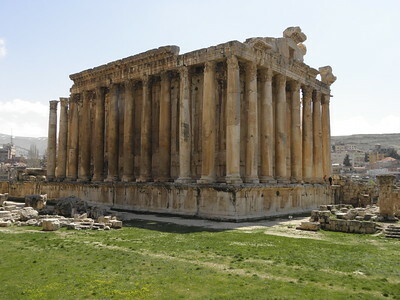 Baalbek site, located inside Baalbek, the administrative centre of the Bekaa valley and one of the places you wlll be advised against travelling to in Lebanon, contains spectacular ruins of Roman temples of Bacchus, temple of Jupiter and temple of Venus. They were built on a magnificent scale, 23 metres high, with columns 2.2 metres in diameter. The sheer scale of everything is mind-blowing. I enjoyed climbing on top of one of the large Corinthian-style column head. Another awesome thing, you can walk around, climb wherever you want, without some nasty local guard whistling at you to shoo away (greetings to Delphi). There are two museums on-site: one in the medieval tower and another in an underground tunnel on your way back. There's also a small tourist info centre by the ticket office, though at the time of our visit it was blessingly vacant with some booklets of other sights, in Arabic only. We got there with a car, passed some checkpoints on the way, but nobody checked our passports, the soldiers just waved us away with attests to the calm situation in the area. No Hezbollah check points I've read about in other blogs. But you will feel it's a Hezbollah territory, especially by the souvenir vendors offering their prime product: a Hezbollah t-shirt. There's a parking spot by the site and from there it's about 500 metre walk to the entrance. The site had a number of tourists, but they dispersed due to the sheer size of it. It was the highlight of our trip to Lebanon and I really enjoyed it. If you're looking for a reason to visit the country of the cedar tree, this is it. Baalbek is the great “must do” site if you are in Lebanon. It is situated not far off the road across the mountains to Damascus and could conveniently be taken in on such a journey. This detour takes you into the “infamous” Bekaa Valley. We were there in 1999 and, apart from passing under archways carrying pictures of Ayatollah Khomeini, we saw nothing else to remind us that this is the heartland of Hezbollah in Lebanon. Everything was very relaxed. The ruined city is primarily Roman but had Phoenician and Greek origins. The height and solidity of the remains is very impressive. The setting below the snow-capped mountains is also rather fine. We were there in April and, although we had a rentacar, the road west over the mountains to the Cedars of Lebanon WHS was still closed by snow but should be an interesting journey a month or so later. A couple of hours to wander round should be enough for all but “Roman Architecture buffs”. Ibn Battuta: "After Jabal Lubnan we came to the city of Ba'labakk [Baalbek], a beautiful and ancient place and one of the most agreeable cities in Syria, surrounded by glorious orchards and superb gardens, with flowing streams traversing its land, and rivalling Damascus in its boundless amenities." Out-of-place artifacts: Almost impossible to move with Bronze Age technology.